Flavanols are antioxidants found in dark chocolate, vegetables, fruits, red wine and tea. They promote nitric oxide production by the endothelium-the cells lining the blood vessels. Nitric oxide (NO) is a vital chemical that promotes blood flow and helps maintain a low blood pressure and healthy cardiovascular system. The inner lining of the blood vessels release NO, which helps control blood flow to the tissues. Problems with energy levels, sexual performance and blood distribution are often due to the inability of the endothelial cells to secrete NO. Australian researchers found that feeding dark chocolate high in flavonols improves endothelial function as measured by post-exercise muscle blood flow, but did not influence the effect of exercise on body fat or fat metabolism. 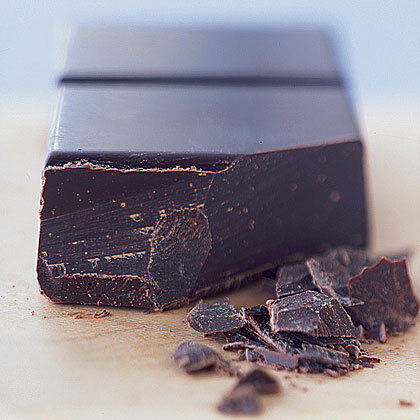 They concluded that dark chocolate is a wholesome food that promotes blood vessel health. It is high in calories, so don't eat too much of it.